CN Terracotta Ltd is the sole distributor of architectural terracotta materials for CN Ceramic Co Ltd (CNC), one of the largest, most respected and innovative manufacturers of terracotta in the world. CN Terracotta operate across Australia, New Zealand, Africa, Middle East, the United Kingdom and Singapore. CNC have been at the forefront of terracotta manufacturing for facade materials including terracotta louvres, panels and high-grade exterior wall split tiles for over 15 years. As specialists in façade engineering and rainscreen cladding we continue to invest in the most advanced European production methods available, all certified to ISO 9001/14001 standards. CNC has the capacity to produce an incredible amount of architectural terracotta, all manufactured to the highest standards of quality and accuracy. This manufacturing capability is coupled with the ability to create an almost limitless range of colours and surface finishes to suit the most exacting design requirements. With a talented, highly focussed and dedicated team of architects and engineers, CN Terracotta are well positioned to be your preferred Partner across the full life cycle of your project. We will work closely with you in the selection, design and supply of your next terracotta façade system. This may be a new build or a refurbishment, a residential building, soaring skyscraper, office facility or virtually anything in-between. The clay we use is recovered from the same original source used to create the iconic Chinese Terracotta Army. This is a testament to the quality and durability of our natural product. CN Terracotta offers a unique combination of over two thousand years of tradition - balanced with modern, environmentally friendly, efficient and economic production methods. This combination of benefits, coupled with experienced architects and world class engineering and project management professionals will ensure your development delivers on its full potential. The factory was built in 2003 specifically to take advantage of its unique geographic location. The Yixing region is fertile in “Purple Sand” clay, also known as “5 colours soil”. As long ago as the Stone Age, hardworking inhabitants of Yixing started to make pottery by using the naturally occurring purple sand clay. This natural technique, which extracts the colours directly from the raw material, has been in use for thousands of years. Following hundreds of years of learning and development, the purple clay pottery culture has now evolved into a charming artisan industry that combines terracotta modelling, sculpture, painting, calligraphy, and literature. The local pottery culture has been listed as part of the National Cultural Heritage. Unique purple sand clay and the legendary pottery techniques employed, make Yixing city “The Pottery Capital of China”, this brand is recognised globally within the pottery community. All CN Terracotta materials are based on the “five colour soil” still produced by the natural colouring technique. This gives our products a strong and distinct competitive advantage over everyone else, new pigments, glazes and innovative surface finishes are being added constantly. The iconic provenance and historic nature of its source material and the natural purity of colour are just two reasons why CN Terracotta products continue to win favour and lead the way with designers and developers worldwide. CN Ceramic Ltd is located in the pottery capital of China - Yixing City, Jiangsu Province, renowned for the research, development, production, and sale of terracotta louvres, terracotta panels and high-grade exterior wall split tiles for Facades. Constant innovation is at the heart of the business, pushing the boundaries of quality, size, colours and textures to suit the most adventurous of Architectural minds. · split tiles : more than 1 million m2. 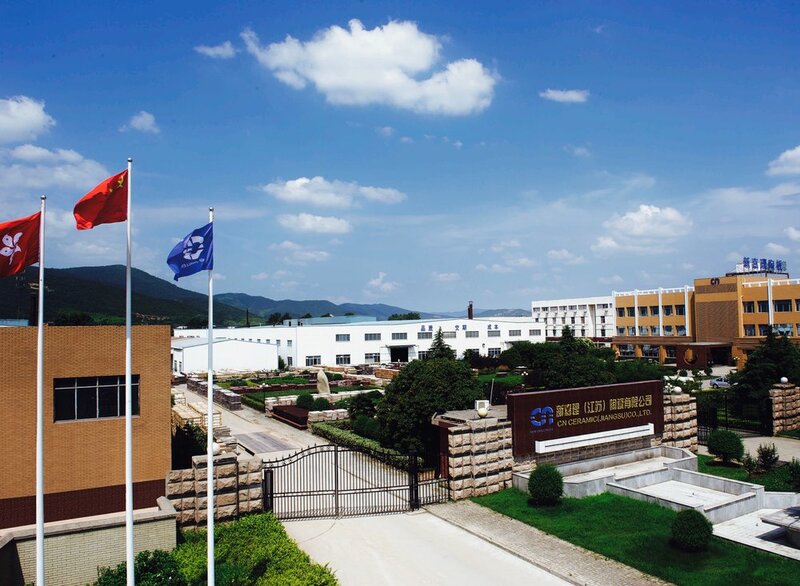 At present, CN Ceramic has two leading terracotta panel production lines that both use imported European machinery. A state of the art, brand new 3rd production line is currently being commissioned which will enable a step change in capacity to meet the growing demand for this eco friendly, versatile and durable material. The right product for the increasingly challenging and safety conscious world we live in. The first manufacturing line is used for producing the ordinary standard products and utilises an Italian vacuum extruder, roller kiln, and German cutting machine, loading ＆ unloading robot, and chamber dryer. The second manufacturing line produces the larger size products and special customised products. It consists of a German extruder machine, an Italian cutting machine, The factory utilises highly automated and advanced logistics and storage systems, five layer horizontal dryer, roller kiln and edge grinding machine. All these machines and their processing techniques represent the leading technologies in terracotta panel manufacturing worldwide.